A Story of Reconciliation... With Mathematics! Here is a very good idea proposed by our Buzzmath expert, Simon Lavallée, on how to introduce decimals to your students. An idea used in Valérie Lebel’s classroom, a Math resource teacher at Dollard-des-Ormeaux school of the Central Québec School Board in Canada. In my two previous articles—Fraction Number Sense and Adding Fractions, Demystified, I showed you how the ideas of activities used by Valerie could offer a material supported version of various mathematical concepts to provide a pictorial model to your students and thus, facilitate their understanding of fractions. Today, I continue our explorations by looking at decimal numbers. This time, Valérie proposes to use the bars first, emphasizing that the white bar represents 1/10 of the orange bar. Then, she introduces the blocks: 10 orange bars or 100 units. In the 5th and 6th grade, we can also use blocks of a 1000 units. She begins with the bloc to represent the unit. 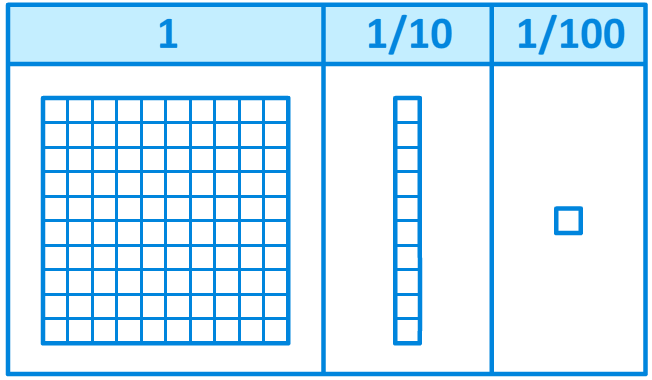 Thus, the bar becomes a tenth since it takes ten bars to form a whole and the unit becomes a hundredth as one hundred units enter in the block. Got it? It is a simple enough idea, isn’t it? Somebody just had to think of it! I hope that this series of articles concerning Valérie Lebel’s classroom activities for introducing fractions at the primary level will have been useful to you. Don’t hesitate to tell me in the comments section if you have tested them in class and what you thought of them and also, to share your suggestions and other techniques! I’m listening!